Angular uses dirty checking to detect changes. This approach doesn’t pollute the model object. It registers watchers for every object added to the model. All of these watchers are executed whenever Angular’s digest cycle kicks in and if there are any changes to the data. Those changes are processed by the corresponding watchers. The model still remains a plain object, as no wrappers are created around it. But, this technique causes performance degradation as the number of watchers grows. Because Object.observe will be supported by the browsers natively and it works directly on the object without creating any wrappers around it, the API is both easy to use and a win for performance. If Object.observe is supported by a browser, you can implement two-way binding without the need of an external library. It doesn’t mean that all of the existing two-way binding libraries will be of no use once O.o is implemented. We still need them to update UIs efficiently after detecting the changes using O.o. Besides, libraries would internally polyfill the logic of change detection if not all targeted browsers support O.o. Now that you have an idea of what O.o is good for, let’s see it in action. In this code we created an object literal with some data. We also defined a function named observeCallback() that we’ll use to log the changes of the object. Then, we start observing for changes by using O.o. Finally, we performed some changes on the object. O.o runs asynchronously and it groups all of the changes happened and passes them to the callback when it’s called. So, here we received three entries for the three changes applied on the object. As you see, each entry consists of name of the property changed, the old value, the type of the change, and the object itself with the new values. See the Pen emKveB by SitePoint (@SitePoint) on CodePen. The observe() method is capable of detecting changes made on direct properties added to an object. It cannot detect changes on properties created using getters and setters. Because the behavior of these properties is controlled by the author, changes detection also have to be owned by the author. To address this issue, we need to use a notifier (available through Object.getNotifier()) to notify the changes made on the property. TodoType is a constructor function with two properties. In addition to them, blocked is added using Object.defineProperty. In our example the setter defined for this property is a simple one. In a typical business application, it may perform some validations and it may not set value in case the validation fails. However, I wanted to keep things simple. As a last note, you can see that in our example the notification is sent only when there is an update. See the Pen NPzgOO by SitePoint (@SitePoint) on CodePen. Let’s add a new property named done to the class TodoTypedefined above. The value of this property specifies if the todo item is completed or not. When the value of done is set to true, we need to set the value of the property blocked to true as well. See the Pen yyEXGd by SitePoint (@SitePoint) on CodePen. See the Pen GgGEzQ by SitePoint (@SitePoint) on CodePen. 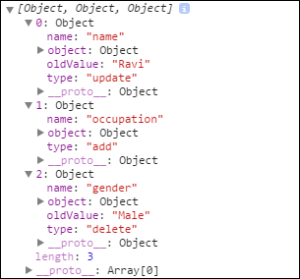 A registered observer on an object or array can be removed using Object.unobserve() or, Array.unobserve() respectively. This method accepts two parameters, the object or array and the callback to be removed. So, to use this method we need to have a reference of the callback. Once O.o is fully supported by all browsers, change detection will be standardized across all client side libraries. Aurelia already started using it, the change detection library of Angular 2, watchtower.js, uses O.o internally, and Ember is also going to use it for change detection in future. Angular 2 and Aurelia have pollyfills implemented to fallback when O.o is not natively available. The future around client side two-way binding will be brighter with this great addition to the browsers. Let’s look forward for other browsers to catch up sooner! watchtower.js was abandoned, Aurelia and Angular 2 have not used Object.observe yet. Nowadays only Angular-Light uses it. I'm pretty sure that within few months, every major framework will start using Object.observe.